What began as an entertainment experience has turned into an innovative way for people to have fun and make memories together. Dave and Buster’s was formed when friends Dave, who ran an arcade, and Buster, who ran a restaurant on the same street, noticed customers going back and forth between their establishments on any given evening. They took a risk to open the first combined food, drink, and arcade establishment and have had great success. Part of the reason for Dave and Buster’s strong growth and reputation is its focus on customer experience. According to president and COO Dolf Berle, Dave and Buster’s is focused on providing an entertaining environment where people can have fun with friends, family, and colleagues and take a break from the stress of everyday life. Dave and Buster’s has found that customers who have a better experience have more interactions with the staff, which fuels its corporate culture of fun. 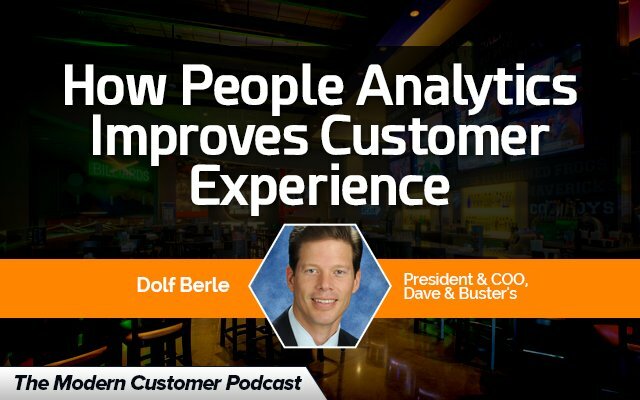 From its early days, Dave and Buster’s has focused on making employees an integral part of the customer experience—if the staff is involved and treated better, they are more likely to create a better experience for guests. To put that into action, employees go through a lot of training to help them feel like an important part of the corporate family. Employees also use the metrics provided by InMoment to see where they can improve and how they can better the guest experience.